Timbalier, Tambour à Cheval. (XVIIe siècle). Règne de Louis XIV. Gravure extraite de l’ouvrage de H. Gourdon de Genouillac. This entry was posted in 1660, 17th Century, Baroque, France, Military and tagged Baroque fashion, French military uniforms, Paris à travers les siècles on 9/14/15 by world4. 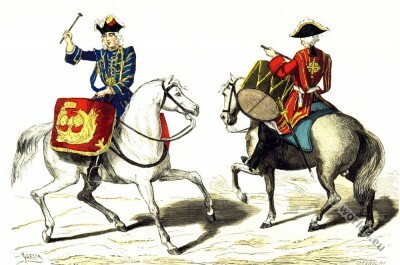 French prince and maid of honor in the Reign of Louis XIV. This entry was posted in 1660, 1670, 17th Century, Ancien Régime, Baroque, France, Nobility and tagged Baroque era, Paris à travers les siècles on 9/6/15 by world4. Elisabeth Queen of Bohemia, Daughter of James the First, 1662. 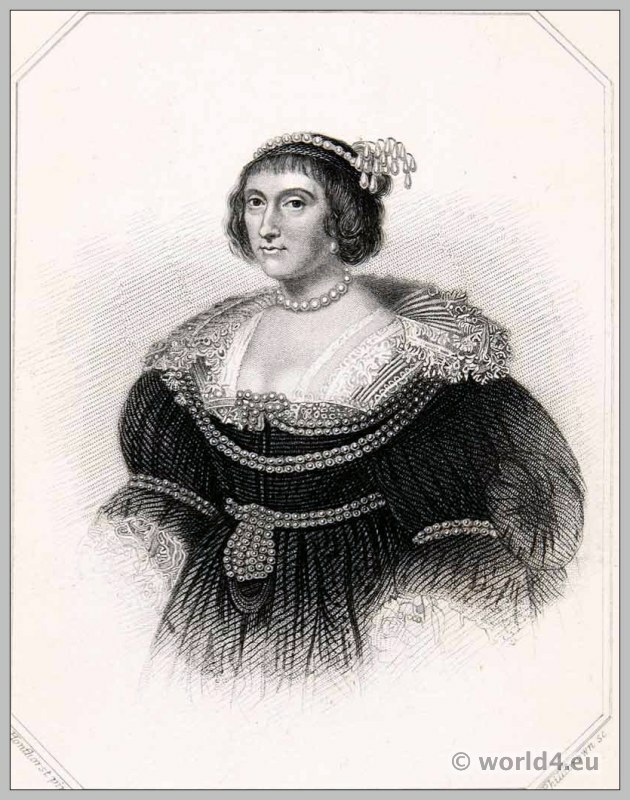 Elizabeth Stuart (1596 – 1662) was Princess of England and Scotland, and by her marriage to Frederick V of the Palatinate, the Winter King, 1613-1623 Electoral Princess Palatine and Queen of Bohemia from 1619 to 1620. Because Frederick V was able to assert itself as a Bohemian king for a year, Elizabeth had to go with him into exile in 1621 in the Netherlands, where she lived for 40 years. Become a widow in 1632, she struggled in particular, that her eldest surviving son, Charles Louis, the Palatinate got back. But it was only in 1648, he received it on a reduced scale. After the restoration of the Stuarts in 1661 she could return to home, where she died the following year. The picture presents her as Bohemian queen. It was probably in 1635, made ​​in the Dutch exile after the death of her husband. Free eBook: Memoirs of Elizabeth Stuart, queen of Bohemia, daughter of King James the First. Including sketches of the state of society in Holland and Germany, in the 17th century. This entry was posted in 1660, 17th Century, Baroque, England, Hairstyle, Nobility and tagged Portrait on 2/12/14 by world4. 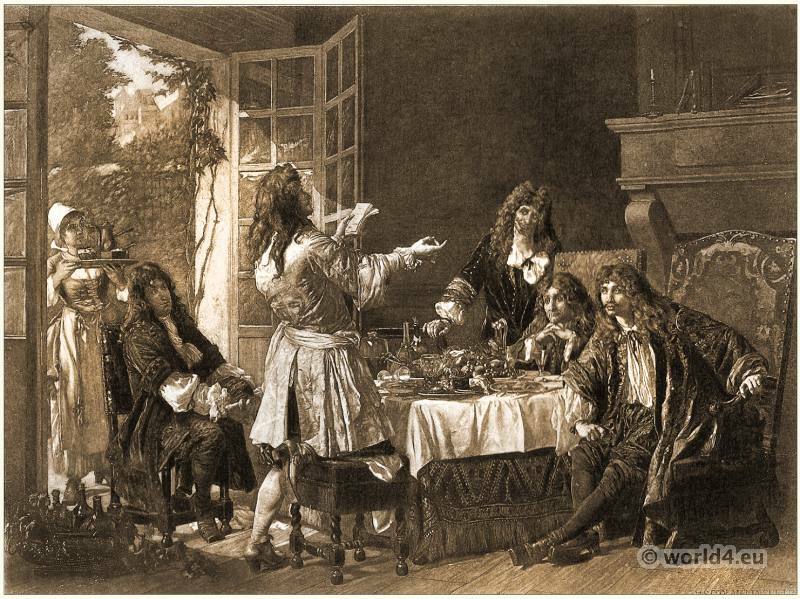 A Dinner at the House of Molière at Auteuil. 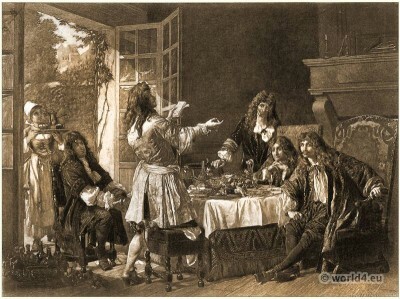 Molière 1622-1673 was a French actor, theater director and playwright. He is one of the great classics and made the comedy to a tragedy potentially equivalent genre. Photogravure by George-Gaston Mélingue. Editor: Charles F. Horne. Great Men and Famous Women. A Series of Pen and Pencil Sketches of the lives of more than 200 of the most prominent personages in history. This entry was posted in 1660, 17th Century, Ancien Régime, Baroque, France and tagged Allonge wig, Baroque fashion, World Theater on 12/20/13 by world4. French Baroque Costume. 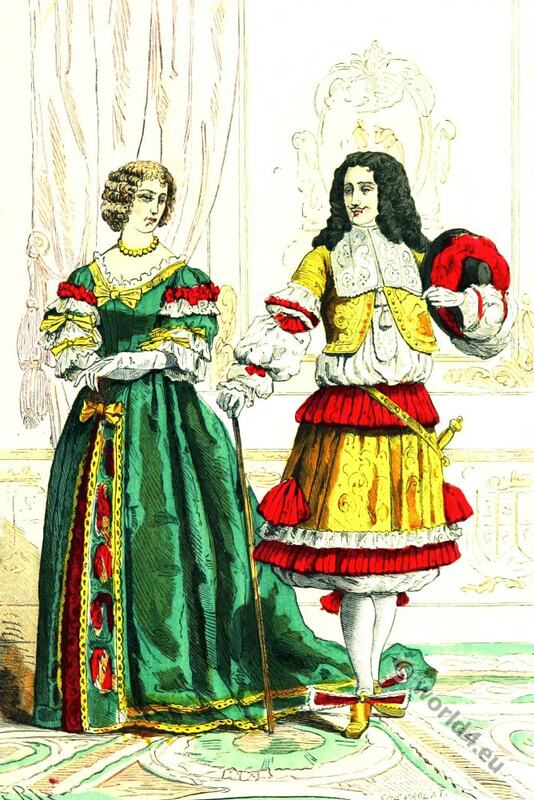 Ancien Régime fashion in the reign of Louis XIV, 1661. Louise-Françoise de La Baume le Blanc, duchess de La Vallière (1644-1710), maid of honour and mistress of Louis XIV. This entry was posted in 1660, 17th Century, Ancien Régime, Baroque, France, Modes et Costumes Historiques, Nobility and tagged Baroque era on 12/8/13 by world4. 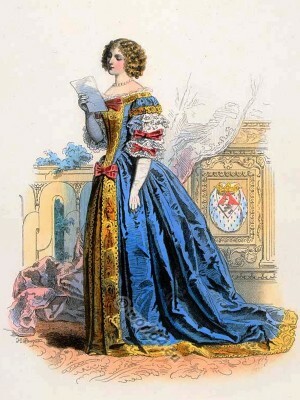 French Comtesse de Grignan, Reign Of Louis XIV, at château de Bussy-Rabutin 1663. This entry was posted in 1660, 17th Century, Ancien Régime, Baroque, Court dress, France, Modes et Costumes Historiques, Nobility and tagged Baroque era on 11/7/13 by world4. 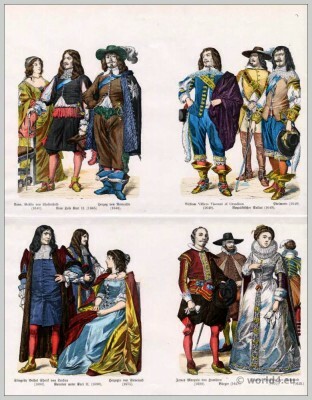 17th century clothing. French Nobel Lady. Nobel Lady at the time of Louis XIV, 1660. 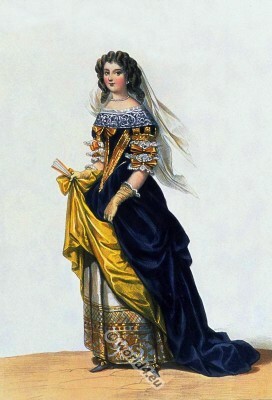 French Nobel Lady at the time of Louis XIV. This entry was posted in 1660, 17th Century, Ancien Régime, Baroque, Court dress, France, Nobility and tagged Baroque era, Costumes historiques de ville ou de théatre on 10/12/13 by world4. 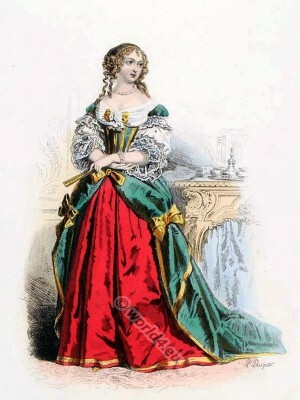 Madame de Maintenon. Coiffure Louis XIV. French Baroque period. Madame de Maintenon 1635-1719. French Baroque period. Françoise d’Aubigné, marquise de Maintenon, briefly called Madame de Maintenon was the last mistress and in morganatic marriage, the second wife of Louis XIV of France. After the death of his wife, Queen Maria Theresa of Austria in October 1683, Louis XIV went to the Maintenon secretly a left-handed marriage (The right hand is the oath hand, the hand of the marriage alliance. The left-handed marriage granted the wife in the aristocratic society not full marriage rights, but was merely a special form of concubinage. Not a full legally binding marriage, morganatic marriage, not befitting). Until his death, he lived with her ​​and visited her every day in their rooms. The unclear relationship to the outside of the two and the fact that she was a little older than him, led to some talk on the court and in Europe. In 1685 founded Madame de Maintenon in the town of Saint-Cyr-l’École (Arrondissement Versailles) a boarding school, Maison royale de Saint-Louis, for 300 daughters of impoverished noblemen – the Maison Royale de Saint-Louis. There she retired after the death of the king in 1715, without ever having to leave the place again. The tomb of Madame de Maintenon lies in the Chapel. 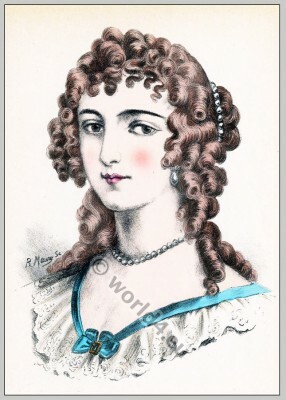 This entry was posted in 1660, 17th Century, Ancien Régime, Baroque, France, Hairstyle, Headdresses, Nobility and tagged Baroque era on 6/6/13 by world4.